Once Fall takes root, many vintage and classic car owners prefer to hibernate their pride and joy to steer clear of the worst of the cold winter weather. However, it’s good to keep in mind that cars are designed for regular use and leaving them dormant for too long may do more harm than good. 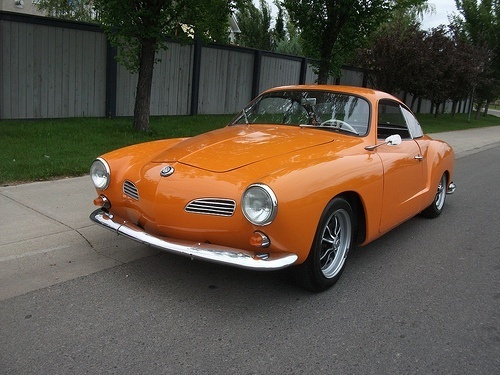 A nice 1960 Karmann Ghia. Photo Credit: dave_7. Therefore, before you park your favorite old car for the winter, you need to take the right precautions. Otherwise, you may find that the car you drive in the spring has rust, mold, flat spots on tires, a battery that needs to be replaced, etc. Before you tuck your cherished vehicle in for the winter, there are some important jobs to be done in preparation. A high pressure water jet will flush all the trapped mud and dirt which cause corrosion from those hard to reach nooks and crannies. Once done, you can blast the remaining moisture from the car by taking it for a final drive. Then wash, dry and polish with a quality wax to protect from airborne pollutants which can damage the paint. Chrome bumpers should be treated with Vaseline or chrome polish. Fill your car with fresh oil and change filters before storing for the winter. Stale oil contains corrosive products and can corrode the engine. A fuel stabilizer is a good idea as well – add a container of stabilizer to your vehicle’s gas tank before you put it into storage. Make sure to leave a window a little open, as moisture that’s trapped inside your car can condense on cold car windows and damage the interior. However, don’t leave the windows open too much, as bugs and small animals might try to hibernate in your hot rod. While we’re talking about animal infestations, it’s a good idea to stuff your vehicle’s tailpipe with a rag, along with any other openings that a mouse might try to nest inside. Your garage or parking area should be cleaned and clutter removed as well, which reduces the odds that mice or other rodents will be in your vehicle’s vicinity. Large packages of silica (a moisture-absorbing mineral) are available online for a fair price, and do a great job of keeping your vehicle interior dry for months at a time. If you have a big problem with moisture (such as a car with a real wood interior), a heated and humidity controlled garage may be your only option. Your local car museum can often accommodate your vehicle for a fee. 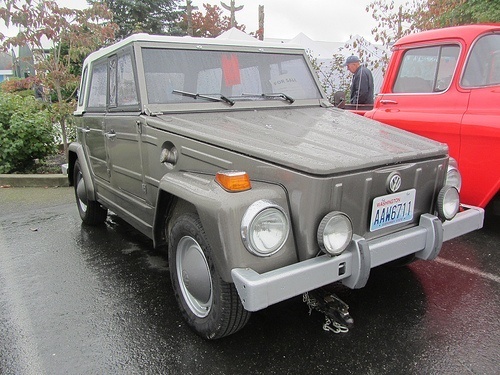 A nicely restored VW Thing. Photo Credit: Hugo90. A cover is an OK substitute for parking your car in a garage, but there are some caveats. First, make sure you purchase a breathable car cover. Covers that don’t allow air circulation can do more harm than good: they can trap condensation against the paintwork. Next best is an “instant garage” – a temporary building (some are inflatable) that provides protection at a fraction of the cost of a new building. If you don’t plan to move your car during the winter months, you may be tempted to disconnect the battery and call it good. However, the best way to ensure your battery maintains function after a long period of storage is to disconnect it and then hook it up to a charger/conditioner for the entire storage period. Lead-acid batteries will last longer if you can keep them fully charged. What’s more, consider disconnecting and removing the battery from the vehicle. This prevents leaks that can damage your vehicle…some classic cars’ floorpans, such as VW Beetles, are susceptible to corrosion from battery leaks. NOTE: If you remove your battery, don’t store it on a concrete or masonry floor, at least not without putting some insulation (like a piece of carpet or cardboard) between the battery and the floor. Concrete and masonry floors cause batteries to drain, as they create a temperature gradient inside the battery. Remember: If a handbrake is left on for a considerable amount of time, you run the risk of the pads/shoes sticking to the brake rotors/drum. Keep the handbrake off and chock the wheels to prevent it from rolling. When a vehicle sits for long periods of time without moving, it’s tires can form flat spots. While there are some things you can do to prevent flat spots – over-inflating the tires by 10 psi, rolling the car in and out of the place during storage, etc., the best idea is to get your vehicle up on some blocks so the pressure is off the tires. Last but not least, ensure that your beloved vehicle is safe and sound. Prevent vandalism by parking your vehicle in a well-lit area. Prevent outright theft by “blocking in” the vehicle with other cars, by removing the battery, or even by removing the steering wheel. If the vehicle’s wheels are valuable, employ a couple of sets of unique wheel locks to protect them (or remove them altogether). Guest Author Ian Cushway is a veritable VW expert. He’s forgotten more about classic Volkswagens than most people know. 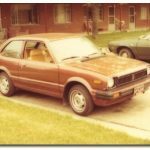 Be sure to read his blog on VWHeritage.com.